All currencies do not need to be scarce. For instance, a currency can be designed to be always in sufficiency, because it is created at the moment of exchange as a credit for the seller and as a debit for the buyer. We fear scarcity, the sense that there is never going to be enough for everyone. The sense of scarcity has driven human competition since the dawn of civilization—for water, for hunting territory, for women, for land. On Spaceship Earth, scarcity is a fact of life. Fossil fuels are increasingly scarce, along with sweet water, rainforests, precious metals and fine jewels. Other things will always be scarce—good pitching arms, original Rembrandts, Cliff Walk properties in Newport, operatic sopranos, true genius. When there are a lot of people who want very scarce things, the value of the scarce resource goes up relative to other resources—this is simple supply and demand economics. Money is also scarce. There is never enough of it for everything people need. We all are so accustomed to money being scarce that it’s hard to imagine a world where there is enough money for everyone. One of the important lessons all students learn in Economics 101 is that when money supply increases, inflation increases, so there’s a good reason for money to be scarce—we don’t want its value compromised by too much inflation. But what if inflation is only the result of too much of a particular kind of money—this bank-debt money we accept without question? There are other units of exchange that aren’t ravaged by inflationary trends. Is inflation the result of a lot of money in circulation, or is the type of money in circulation responsible for inflation? In fact, to retain its value, bank-debt money needs to be scarce. At least twice in history, a form of money has existed where there was no incentive to accumulate it as a store of value because it didn’t earn positive interest in bank accounts. Instead, it had the equivalent of a negative interest rate (known as demurrage)—the longer you held on to it, the more you would have to pay—similar to a parking fee on money. This gave people who were paid in this currency a strong incentive to spend it or to invest it—preferably in things that would continue to be valuable over the long term. The velocity of this type of money, in other words, was quite high. Since people didn’t hoard it, it also was not scarce—there is strong evidence that its existence fostered long periods of prosperity in Dynastic Egypt and during the Central Middle Ages (10th-13th centuries) in Europe. In the first example, from Egypt, people would receive shards of pottery with a date on them when they put their grain into the storehouse. The longer the grain was stored, the more the charge was for the guards and waste as the grain spoiled. Called ostraka, these shards circulated alongside the precious metals rings and bars that were used for trade with foreigners. The Greeks, Egypt’s main trading partners at that time, would mock the plain clay Egyptian currency. Yet the Egyptians thought the Greek obsession with metals was strange, “a piece of local vanity, patriotism, or advertisement, with no far-reaching importance,” as Henry Ford noted in his 1922 autobiography My Life and Work. They would accept Greek coins, but only for their metal content. The ancient Egyptians enjoyed an abundant and prosperous life. They lived in a fertile valley, producing grains, meat, wine, and beer in quantities sufficient for all levels of society, and they were well-educated. They invested in quality public works and their irrigation systems were the envy of the world. When they built something to last, they built it to last forever—the pyramids and temples of this ancient culture survive today. There is evidence that the money they used—this negative interest money made of plain clay shards—was at the root of the good life they enjoyed. The ostraka system, known as the corn standard system, was used for over 2,000 years until the Roman conquest of Egypt around 30 BC. When the Romans replaced the ostraka with their gold and silver, the long period of prosperity ended. From then on, positive interest charges accrued to Rome. Over time, this in turn changed Egypt into the equivalent of a developing country: poverty increased, as did the gap between the rich and the poor. The second example of demurrage, or negative interest money, was special coinage used for local payments during the Central Middle Ages in Europe. These coins were produced by monasteries, bishops, provincial aristocracy and townships, and bore the resemblance of the current Bishop, Lord, or King (seignoriage means fees earned through an authority’s issuance of standardized currency, and it is derived from the Old French seignior, or lord). During Carolingian times, the coins were changed when the rulers changed (a practice called renovatio monetae), and a recoinage tax would be assessed on the coins that were turned in. So the last person holding the coins would end up paying the tax. This provided a strong incentive to spend money rather than hoarding it for the future. However, instead of waiting for a lord to die, renovatio monetae evolved to a system where every five or six years coins would be reissued. The recoinage dates were not always predictable, and the abuse of this practice resulted in more frequent recalls. Like all taxes, the recoinage tax was not liked by the people, and yet without their knowing the existence of a negative interest currency led to a flourishing medieval society, especially during the period between 1000-1300 AD. Local coinage was not the only kind of money—as in Egypt, long-distance trade with other countries (usually for luxuries) required some kind of convertible coin, usually made of precious metal. But local currency was an important medium—or even the dominant one—for local trading, and its periodic tax gave people an incentive to spend money on productive items rather than to save and hoard it. This increased velocity made the coins less scarce. As in Egypt, it also led to an era of building where things were made to last—the great cathedrals of Europe were all built during this period. The era came to an end as centralized authority expanded, enabled and further strengthened by the introduction of gunpowder in the 1400s. As kingdoms grew, reissuing money became more and more cumbersome. This, combined with opposition to the practice (it was a tax, after all), as well as its abuses, led to its demise. Rulers like King Philip IV of France turned to debasement (reducing the metallic content in the precious metal coins) rather than demurrage for their taxes—an early trigger for inflation. This change, introduced in the 1290s, preceded the economic collapse that provided fertile ground for the plagues that ravaged Europe beginning in 1347. The point here is not to wax nostalgic for some lost golden eras, as there were plenty of other problems that people had to struggle with at those times. Rather, the purpose is to show that there are alternatives to a monopoly of the particular form of money we have in existence today. It is also an illustration of the possibility of separating two functions that money serves - the store of value and the means of exchange - as a way of creating more prosperity and more economic activity. All currencies do not need to be scarce. For instance, a currency can be designed to be always in sufficiency, because it is created at the moment of exchange as a credit for the seller and as a debit for the buyer. Examples of this are mutual credit currencies, which form the basis of Time Banks, commercial barter systems, Local Exchange Trading Systems (LETS) and others. For example, in the Onion River Exchange—Montpelier, Vermont’s Time Bank—if I need a ride to the airport and you are willing to give me a ride to the airport, we’ll agree on an amount of Community Credits (the name of the currency units, which in this case are measured in time) to exchange for the service, and off we go. Community Credits are simply notations in a central computer system and there are no notes or coins exchanged at all. You don’t need to have surplus to make transactions—it is acceptable to have negative balances in the system. The optimal balance, in fact, is zero, since that would mean you are giving as much to the system as you are receiving. There is no inflation in such a system, and no worries about overabundance triggering lower values. 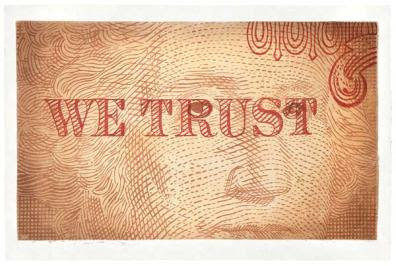 Let us emphasize that such a currency is sufficient for the purpose it serves. Cooperation is high—every transaction in the system is a result from an agreement. There are no price wars or people trying to secure a monopoly on a particular good or service. The quality of transactions is high, and the exchange’s reputation spreads more by word of mouth at the events and social opportunities which it organizes. A Time Bank or mutual credit system will never, and should never, take the place of all money. The goal is rather to provide an additional means of exchange that is sufficient to meet our needs for a variety of goods and services. It is fair to say that fossil fuels will never be traded in a mutual credit system; in fact, on that ride to the airport it is likely that you would pay some cash for the gas cost, since the airport is a 45 minute drive from Montpelier. However anything you can spend time on is fair game in a Time Bank. And there are always just enough Community Credits to go around—they only come into existence at the moment they’re needed. The value of time through history has been the subject of many economic theories, practices and terms. They include Marx’s labor theory of value, opportunity costs, just in time manufacturing, discount rates and minimum wage. Time is clearly a critical piece of the economic system. The notion of scarcity casts a shadow on our idea of the value of time. We recognize that there are people with more skills and knowledge than we have, and so we pay more for their time as a result. Rocket scientists, brain surgeons and sports stars all have something that is relatively scarce—a talent or an ability that is highly valued. Jobs that require fewer skills, on the other hand, don’t command as high a pay rate, largely because there are more people who can do them. The abundance of people with the skills makes the jobs more competitive, and the wages lower. There is only one Oprah, but house cleaners and street sweepers are numerous. Yet just because there is an abundance of something does not necessarily make it less valuable to us as a species, even if its monetary value is relatively low. Every day we all need at least some of the following: child care, elder care, health services, food preparation. If we had to pay money for every moment of time that was spent on this part of our economy, we’d quickly go bankrupt even if the people we employed were not highly compensated. Time is a great equalizer. We all only have 24 hours in a day, and how we choose to spend it is largely dictated by the economic system we’re in. If we’re part of a hunter/gatherer society, anthropologists have observed that we spend about 20–30 hours a week in activities that could be classified as work and the rest of the time playing games, making music and hanging around the camp. In the feudal system during the European Middle Ages, the breakdown of hours worked as compared to hours spent doing other things was about the same. Now, in so-called advanced civilization, we are spending many more hours per week working for pay and fewer hours in recreational, social and spiritual pursuits. Why have we chosen these priorities in our society? In Bali, the people have recognized the value of community time for millennia and have a dual currency system that accounts for the time people need to spend on community activities. Community life is rich—each Balinese spends about 30 percent of their time on creative endeavors—dance, artwork, ceremony—that contribute to community life, particularly the elaborate ceremonies undertaken in their temples. The people are also part of a community group called a subak, which maintains the irrigation systems for rice production, and a banjar, which coordinates the civic life of the community, a bit like local government. In most cases, there is no problem finding enough people to contribute the time needed to complete an activity; thus contributions of time are not recorded. In some banjars, however, where there is a scarcity in the contribution of time or when there are complaints from some members about the lack of contribution by others, the Klian Banjar records every contribution of time. Those who cannot contribute their share of time are asked to send a substitute person. If neither option is possible, they must then pay a charge of between 5,000 and 10,000 Rupiah (approx $1.20 US) for each time block missed. It may sound inexpensive enough so that you would assume people would buy their way out of community service, but in practice this is done only occasionally. So, the work goes on, and both time and money help pay for it. The dual currency in Bali makes it possible for there to be a lot of flexibility with different projects, depending on the community. In wealthier communities where people have more money and less time, projects that cost more are easily approved. But in poorer villages more time and less money is available, but elaborate festivals and projects are still possible because the people choose to put in more time. There is less division between the wealthy and the poor for occasions like weddings and funerals as a result, because even people who are relatively poor in monetary terms can have big celebrations for major life events. The community work extends to other local tasks as well, such as improvements at the school or on roads, especially if the national government has not done its part. Perhaps we have lost something in the West. Our affluence has made it possible to buy our way out of community service, even though we complain bitterly about all the taxes we pay to local and state governments. We don’t spend our time on community projects in any official way, and that leaves the work to be done for pay, which is rapidly escalating out of control. On one level, time isn’t money, and the intrinsic value of time can be captured through different exchange systems like Time Banks. Revaluing time can also move us towards a sense of sufficiency and abundance, since the things we need in abundance are impossible to fully value with a conventional money system. Child care is low-paid work because it is abundant, and yet what is more important than raising our children? Elder care is low-paid work for the same reason, and the abuses and neglect in that system make regular news as a result, a tragedy of epic proportions. Clearly something is not working when these critical life functions are systematically devalued by society. But every mother, father, son and daughter is caught in the dilemma of the cost of time. How can they give up the work paid at $30 per hour for tasks that people get barely above minimum wage to perform? It doesn’t make economic sense—in most cases taking the time to do elder care or child care would mean economic hardship for the family. While it might be impossible to recreate the cultural norms that Bali has had in place for over 1,000 years in the average U.S. suburb, finding a way to revalue community time is important for a sustainable community. A balance between competition and cooperation is critical for our civilization and our survival. Yet the monetary system we have developed, which is now the primary one worldwide, focuses only on the competitive side, and therefore fosters competition at the expense of cooperation. Much of the balance of Creating Wealth is about currencies which foster cooperative behavior that can counterbalance the existing system. One of the key questions is whether they can be introduced at a speed and scale adequate to face so many global crises. The evidence of their effectiveness would suggest that a “two-game” economy could provide a more resilient prosperity over the long term. One of the critical faults of the national money system’s tendency to value only those things that are scarce is its propensity to leave many economic resources undervalued and/or underutilized. Introducing complementary currencies links underutilized resources with unmet needs—this is the primary way these currencies create new wealth. Empty airline seats are transformed into customer loyalty and higher profits. Undervalued time is transformed into critical services needed to help elders be involved in their communities. Excess inventory can be liberated to serve people without the resources to buy it, in exchange for other things highly valued by the company. The idea is to design complementary local currencies that are backed by or redeemable in some of those underutilized resources and can be mobilized to meet unmet needs. Empty stadium seats at sporting events might be offered to people who volunteer to coach student sports or who mentor youth in other ways. The marginal costs to the sports facility do not increase with more people filling the seats, and while they would always prefer to sell the seats, the fact remains that an empty seat is an unsold seat. The same principle applies to empty seats on public transportation systems, seats in the theater and tickets to public and private recreational facilities: amusement parks, swimming pools, golf courses and ski areas. Obviously there might be some interest in making the free passes available at times when the facilities are not at capacity, just as airlines black out times when frequent flyers can’t use the seats. The greatest underutilized resources of all are the people in every community. Our specialized economy has tended to make each of us focus on one fairly narrow task at work, and yet we have meter readers who are talented artists, store clerks who knit award-winning sweaters and scarves, bankers who are expert cabinetmakers, insurance salespeople who love to teach. When you factor in the people who aren’t working—the unemployed, the elders, the underemployed—the pool of skills, knowledge and time grows exponentially. But our current system doesn’t have an effective way to mobilize people, largely because we are so dependent on money to do it. Caring, learning, civic engagement, the arts, social justice, a clean environment ... what would our lives be like if people didn’t spend their time on these things? Yet the structure of the market economy based on scarce national bank-debt money is systematically robbing us of our ability to spend our time on these activities, even if we are employed. People are spending more of their time earning a buck, and less of their time making a living. Complementary local currencies that match unmet needs with underutilized resources can be described as sufficient—in mutual credit systems they come into existence as and when needed. The supply does not need to be tightly controlled by a central authority, there is no inflation if they are correctly designed, there is always enough of them to go around. The idea of enough captures a sense of sufficiency. On the level of meeting important needs, enough is exactly right. If we are hungry, we don’t need to overeat. If we are cold, we don’t need to overheat. If we need to go from our house to the doctor’s office, we don’t need to go back and forth the same day—one trip is sufficient. Yet finding sufficiency in matching unmet needs with underutilized resources creates an abundance that is otherwise not as available. These transactions are a source of real wealth, and can liberate all sorts of skills and talents that are otherwise ignored. We are in possession of well-being when our needs are met. We can have all the money in the world, but if we are not healthy, in a loving relationship, with access to a civic and cultural life to feed our soul, the money becomes useless. Further, the scarce money we depend on today creates a dynamic all its own that pulls us away from the things that are really important in life; how many people spend more time earning or managing their money than they do with their families? How many days off come and go where we are just too tired to go out and do anything fun because the working week has robbed us of all the energy we may have had to do something rewarding and fulfilling? Recapturing the value of the cooperative currencies and integrating them into our everyday life can restore the lost balance we need and make the circle whole again. Gwendolyn Hallsmith is the founder of Global Community Initiatives, and the Director of Planning and Community Development for the city of Montpelier, Vermont. Bernard Lietaer is the world’s leading authority on complementary currencies and the author of The Future of Money. Creating Wealth is published by New Society Publishers and is available now. NOTE: There are a couple of relevant articles posted at the Utne Reader website titled "